Inspired by famed occultist Aleister Crowley's 1923 novel of the same name, Agusti Villaronga's film centers around the extraordinary 12-year-old David (Enrique Saldana), who has been adopted by a treacherous scientific cult where extraordinary mental powers are common. He begins an archetypal journey across two continents with Georgina (Lisa Gerrard) to find his destiny as Child of the Moon. 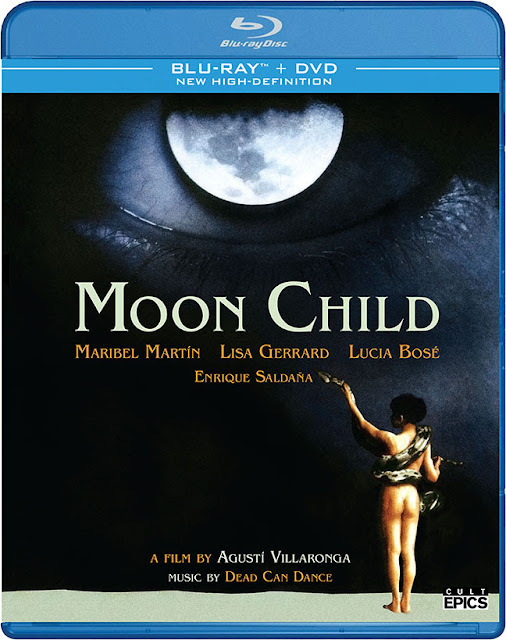 Coming on the heels of Villaronga's unforgettable 1986 film, In a Glass Cage, Moon Child is a mystical fantasy film for adults, available for the first time in the United States on Blu-ray and DVD. Presented in a new High Definition transfer and boasting an unreleased soundtrack by the band Dead Can Dance, Moon Child is a thoroughly unique gift to cinema and music fans alike. - New HD Transfer from original 35mm film. - Interview with Agusti Villaronga (2018). - Lobby Cards photo gallery. - Isolated Score tracks by Dead Can Dance.